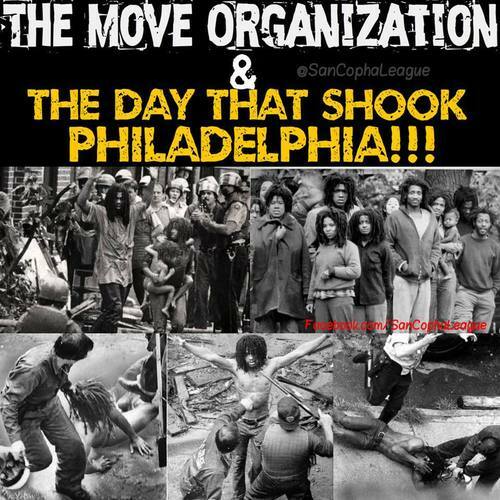 The Move Organization is a Black Liberation group from Philadelphia started by John Africa in 1972 According to the group the word MOVE is not an acronym It means exactly what it says MOVE, work, generate, be active Their philosophy is everything that’s alive moves and If it didn’t, it would be stagnant, dead. Movement is their principle of Life. Self Defense is also one of their principles of life and On May 13, 1985 they definitely showed that The confrontation began when police came to their house over 100 strong with guns aimed and demanded the MOVE members come outside Still angry from the 1978 confrontation with police which resulted in 9 MOVE members being sentenced to 30 to 100 years in prison, they refused The police then began throwing tear gas and opening fire at the house The MOVE house had been built as a bunker and they began shooting back After hours of shooting the Police called for a helicopter and dropped a BOMB on the house Yup you read right The cops dropped a bomb in the middle of a neighborhood in Philly It’s Crazy how far America will go to subdue Black people After the bomb dropped 65 homes were destroyed and 11 people including 5 small children were killed As the survivors of the MOVE house began to surrender, police continued to open fire at them with automatic weapons One of the MOVE children actually ran into a burning house to avoid being shot by police She would later be found burned to death There is a great documentary that was released that illustrates the constant police brutality they faced and the bombing Today 35 years later the MOVE 9 like many other black political prisoners continue to sit in Prison and each year they are denied the right to parole In a system that has always been so hell bent against us one must wonder When Will We Overcome?